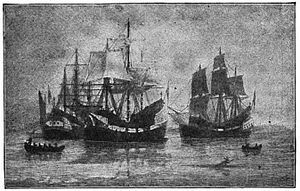 The Winthrop Fleet was a group of 11 ships led by John Winthrop out of a total of 16 funded by the Massachusetts Bay Company which together carried between 700 and 1,000 Puritans plus livestock and provisions from England to New England over the summer of 1630, during the first period of the Great Migration. The Puritan population in England had been growing for several years leading up to this time. They disagreed with the practices of the Church of England, whose rituals they viewed as superstitions. An associated political movement attempted to modify religious practice in England to conform to their views, and King James I wished to suppress this growing movement. Nevertheless, the Puritans eventually gained a majority in Parliament. James' son Charles came into direct conflict with Parliament, and viewed them as a threat to his authority. He temporarily dissolved Parliament in 1626, and again the next year, before dissolving it permanently in March 1629. The King's imposition of Personal Rule gave many Puritans a sense of hopelessness regarding their future in that country, and many prepared to leave it permanently for life in New England, and a wealthy group of leaders obtained a Royal Charter in March 1629 for the Massachusetts Bay Colony. A fleet of five ships had departed a month previously for New England that included approximately 300 colonists led by Francis Higginson. However, the colony leaders and the bulk of the colonists remained in England for the time being to plan more thoroughly for the success of the new colony. In October 1629, the group who remained in England elected John Winthrop to be Governor of the Fleet and the Colony. Over the ensuing winter, the leaders recruited a large group of Puritan families, representing all manner of skilled labor to ensure a robust colony. The initial group (Arbella and her three escorts) departed Yarmouth, Isle of Wight on April 8, the remainder following in two or three weeks. Seven hundred men, women, and children were distributed among the ships of the fleet. The voyage was rather uneventful, the direction and speed of the wind being the main topic in Winthrop's journal, as it affected how much progress was made each day. There were a few days of severe weather, and every day was cold. The children were cold and bored, and there is a description of a game played with a rope that helped with both problems. Many were sick during the voyage. The Winthrop Fleet was a well-planned and financed expedition that formed the nucleus of the Massachusetts Bay Colony. They were not the first settlers of the area; there was an existing settlement at Salem, started in about 1626 and populated by a few hundred Puritans governed by John Endicott, most of whom had arrived in 1629. Winthrop superseded Endicott as Governor of the Colony upon his arrival in 1630. [notes 1] The flow of Puritans to New England continued for another ten years, during a period known as the Great Migration. Six other ships arrived at Massachusetts Bay in 1630 for a total of 17 that year. Nine leading men applied for the charter for the Massachusetts Bay Colony and came to New England in Winthrop's Fleet. A complete list of passengers is maintained by The Winthrop Society, a hereditary organization of descendants of the Winthrop Fleet and later Great Migration ships that arrived before 1634. ^ The Plymouth Colony preceded both Winthrop and Endicott, but they maintained their own system of government and did not fall under the charter of the Massachusetts Bay Colony at this time. ^ Lane, C. Arthur (1898). Illustrated Notes on English Church History. 2. New York: E. & J. B. Young & Co. p. 384. Retrieved 2008-12-15. ^ Proceedings of the Massachusetts Historical Society. 7. Boston: Massachusetts Historical Society. 1891. p. 231. Retrieved 2008-12-15. ^ Higginson, Thomas (1891). Life of Francis Higginson, First Minister in the Massachusetts Bay Colony. New York: Dodd, Mead, & Co. p. 69. Retrieved 2008-12-15. ^ Banks, Charles Edward (1999) . The Winthrop Fleet of 1630. Baltimore, MD: Genealogical Publishing Co., Inc. ISBN 0-8063-0020-5. reprint of original 1930 edition. ^ Winthrop, John (1853). The History of New England from 1630 to 1649. New York: Little, Brown and co. Retrieved 2008-12-11. Second publication of the original text of John Winthrop's journal. ^ Winthrop, John (1853). The History of New England from 1630 to 1649. New York: Little, Brown and co. p. 442. In a letter to his wife, Winthrop put the number of passengers at 700 persons, 240 cows, and 60 horses. ^ Collections of the Massachusetts Historical Society. 9. Boston: Massachusetts Historical Society. 1804. p. 205. Retrieved 2008-12-19. ^ Society, New England Historic Genealogical (1921). "Leaders in the Winthrop Fleet, 1630". The New England Historical and Genealogical Register. 25: 236. Retrieved 2008-12-11. ^ Selected Biographies of Early Settlers in Northern New England. Portsmouth NH: Peter E. Randall. 2000. Retrieved 20 Aug 2015.